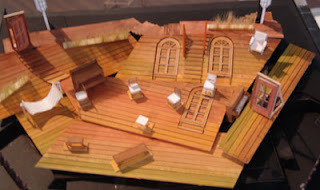 This is the model for Erik Flatmo’s Uncle Vanya set. 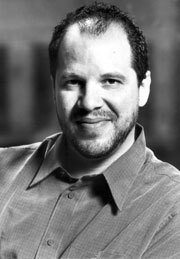 It will be “tipped in like a valley,” says director Timothy Near, “to hold you all in.” There will be a multitude of doors and stairways, to evoke the maze that Professor Serebryakov evokes when he says, in Act III, “I hate this house. It is a regular labyrinth. Every one is always scattered through the 26 enormous rooms; one never can find a soul.” There will also be three moving windows (which you see in their lying-flat position on the miniature stage set above), an grass will come up through cracks in the stage.